﻿﻿﻿Chamber membership is making an investment in Fayetteville and in your business. 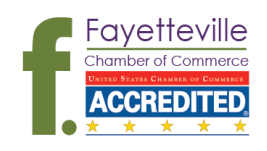 Find out more about the benefits of joining the Fayetteville Chamber of Commerce today. Now Accepting Leadership Fayetteville Applications! to deliver food with the Meals on Wheels program! ​We can always use an extra hand. Looking for employment in Northwest Arkansas? You've come to the right place. Chamber members can also post jobs or search our resume bank. Subscribe to the Chamber eNews and eBlasts to stay up to date with the Chamber and our Membership! The Fayetteville Chamber advocates a positive and vibrant environment that allows our our businesses to thrive and prosper. To be successful in this role, the Chamber, from time to time, takes up certain positions at the recommendations and approval by our member investors and board, respectively. We are interested to hear from Fayetteville businesses or chamber member investors. For information or to contribute, please contact us by completing the form below.